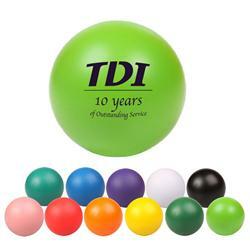 Our popular custom round stress balls with your promotional logo. 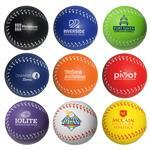 Very popular top seller round 2 1/2" stress balls are personalized with your logo. 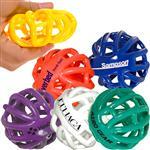 These stress balls come in a variety of fun colors! Give them away at your next convention or event. Keep them at your desk for a quick way to exercise your hands after working at a keyboard. 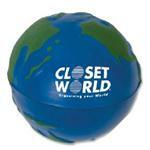 Try our handmade, squeezable, custom stress balls. Inquire for rush. Why order from Adco Marketing? Free 24 hour production, free help with art and we are nice and friendly, based right here in the US. Black; Blue; Green; Orange; Pink; Purple; Red; Turquoise; White; Yellow balls. Available Colors: Blue, Teal, Orange, Pink, Red, Black, Purple, Yellow, White, Lime-green and Hunter-green. Production Times Available: 5 working days. FREE 24 HOUR PRODUCTION. Typical Imprint Area(s): 1.5" diameter. Available Imprint Options: Price includes a one-color, one-position imprint. Imprint area may vary depending on art submitted. Unless otherwise specified, your imprint will be positioned per the item photograph. Additional Colors/Positions: Add $.35 each. 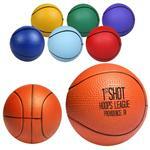 Our stress relievers are made of squeezable polyurethane. Some distortion of the imprint can be expected and ink coverage can vary. Due to the nature of the material, uniformity of the imprint cannot be guaranteed and may break up. Because they are hand made, no two stress relievers are the same. Bulk/250 pcs = 17 lbs.